Nominations are open through October 1, for the 2018 I Love My Librarian Awards. The I Love My Librarian Award invites library users nationwide to recognize the accomplishments of the exceptional public, school, college, community or university librarians. Up to 10 librarians are be selected. Each receives a $5,000 cash award, a plaque and a travel stipend to attend the awards ceremony and reception in New York City, hosted by The Carnegie Corporation of New York. In the award’s first 10 years, library supporters nationwide sent in more than 18,000 nominations for their librarians. A total of 100 librarians have won the award to date. Read about the previous winners at ilovelibraries.org/ilovemylibrarian. Sign up here to be notified about future I Love My Librarian Award activity. Each year thousands of public and school libraries come together each fall in a national effort to remind parents and children that a library card is the most important school supply of all. 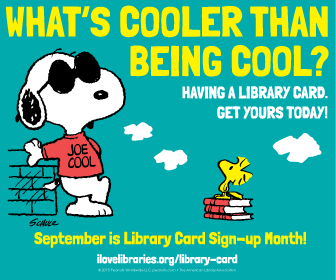 Library Card Sign-up Month was launched in 1987. This September Disney Pixar's superhero family, the Incredibles, will team up with the ALA to promote the value of a library card. As honorary chairs, the Incredibles will remind families, students and people of all ages that signing up for a library card is a great step toward a truly super lifestyle: libraries offer fun and informative resources to help you pursue your passions and succeed in school. Free resources are available for libraries, including a sample press release, proclamation, PSA scripts, as well as print and digital public service announcements and artwork for library cards featuring the Incredibles. Plus, be sure to visit the ALA Store to purchase Library Card Sign-up Month posters, stickers and bookmarks. As the first African American principal dancer at the American Ballet Theatre, Misty Copeland's leadership inspires young people to pursue their dreams regardless of the challenges they encounter. She is the author of several bestselling books, including Ballerina Body, published in March 2017. The National Library Week 2018 celebration marked the 60th anniversary of the first event, sponsored in 1958. 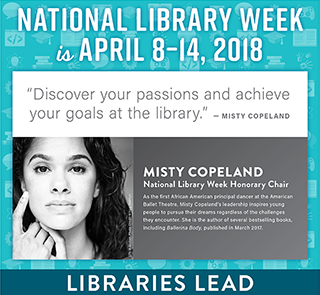 Celebrate National Library Week April 7-13, 2019 with the theme "Libraries = Strong Communities." Visit the National Library Week web page for updates about National Library Week 2019.